"This April, the OUP Philosophy team honours Immanuel Kant (April 22, 1724 – February 12, 1804) as their Philosopher of the Month." inform John Priest, Marketing Assistant at Oxford University Press. Immanuel Kant, Prussian philosopher - (painted portrait). A teacher and professor of logic and metaphysics, this Enlightenment philosopher is today considered one of the most significant thinkers of all time. His influence is so great, European philosophy is generally divided into pre-Kantian and post-Kantian schools of thought. Born in Königsberg, then the capital of Prussia, Kant never traveled more than 100 miles from his hometown. He studied literature, philosophy and natural science at the University of Königsberg, where he spent most of his professional life as an academic. At first Kant did not complete his degree, and after three years working as a private tutor he was able to return to the university and complete his studies and commence work as a lecturer. Kant’s philosophical career is conventionally divided into three periods. The first, or ‘pre-critical period’, runs from 1747, the year of his first publication, ‘On the True Estimate of Living Forces’, to 1770, when he published his inaugural dissertation, On the Form and Principles of the Sensible and the Intelligible Worlds, and received a salaried academic position. In spite of significant shifting of views, the writings of this period are unified by Kant’s abiding concerns with foundational questions in science and the search for the proper method in metaphysics. The middle period (1771–80) is often called the ‘silent decade’, because Kant published virtually nothing, devoting himself instead to the reflections that led eventually to the Critique of Pure Reason. The third, or ‘critical period’, dates from the publication of the first edition of the Critique in 1781. 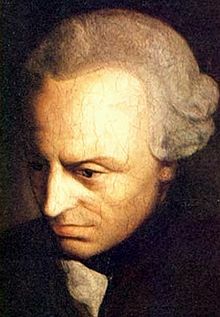 This groundbreaking work soon established Kant as one of the greatest philosophers of all time. Kant himself said the work brought about a philosophical equivalent of the so-called Copernican Revolution, because it reversed the usual assumption that the apprehension of empirical sense-data necessarily precedes the production of the concepts we assign to them. In Critique of Pure Reason Kant sought to overcome what he viewed as the problem of the empiricist David Hume’s skepticism concerning causation. He agreed with Hume that it is impossible to prove that every event has a cause by power of experience, but disagreed with him that one should thereby abandon the general principle that every event has a cause. Kant’s solution is to divide the psychical apparatus in two: on the one side there are ‘intuitions’, the perceptions of given sense data, and on the other side there are categories and concepts (such as space and time), the universal laws of the mind. His rationale is that we could not describe the world in a variety of different ways if we did not have concepts that enable us to see it differently too. But even more importantly, Kant argued that even when a specific cause is not perceptible we nonetheless know that it must exist and that necessity is sufficient to found knowledge. Kant describes the process of attaining knowledge as judgment and identifies three stages in its composition: first there is the apprehension of something that affects the mind, then the imagination reproduces it in the mind, and thirdly it is recognized by the mind which assigns it a concept. Judgment is the application of the rules of understanding to intuitions. These rules are said to be ‘transcendental’ by Kant because they function as conditions of possibility for knowledge. In the subsequent Second and Third Critiques, Critique of Practical Reason (1788) and The Critique of Judgement (1790), Kant turned his attention to aesthetic, moral, and political questions. The power of these later works is so great that Kant is regarded by many readers as fundamentally a moral philosopher.